Drum Sets & Components Archives | Zing! There’s no better feeling than grabbing a pair of drum sticks and tapping out a rhythm on a great sounding drum set. Drums are easily the most physical of all the instruments, and while they’re one of the easiest instruments to learn, it takes a lot of time and patience to become really great. To reach those heights, it’s crucial you use the right gear. In this article, we review the best drum sets available, and contrast and compare the different types. By the end of it, you should know which one is right for you. So let’s get cracking. Standard drum sets usually come with 5-pieces, and the ones we feature here are either 4 or 5-piece. A large bass drum – this sits on its side and operated by a foot-operated pedal (called a bass pedal). Heavy metal drummers often choose to play with two bass drums, which requires a double bass drum pedal to operate. Toms – usually two or more smaller ‘rack drums’ of slightly different sizes, mounted to the bass drum. ‘Floor toms’ sit on their own stand. A snare drum – a type of drum that has stiff, tort wires stretched just beneath its skin which is played with a stick (for a staccato sound) or with a brush. You can play the rims or skins of a snare for extra dynamic range. Cymbals – A hi-hat cymbal is another key component to a drum set. Composed of two cymbals equal in size, facing one another, and mounted on an upright rod. A foot pedal opens and closes the cymbals to produce the sound, but sticks are commonly used to create a dampened strike or ring. Other cymbals are typically used, called ‘ride or ‘crash’ cymbals. Percussion instruments – chimes, wood blocks, cowbells, etc. All of the drum sets we feature in this article have at least four pieces. The five-piece sets add an extra tom. Drum or ‘shell’ sizes vary greatly, but speaking generally, standard kits tend to have larger shells suitable for more volume. Kits more suited to genres like jazz tend to be smaller, less loud and more suited to lighter playing. The most common drum set configuration in the world is a 14″ snare, 12″ and 14″ toms and a 20″ bass drum. Drums (known as ‘shells’) come in a whole host of different wood types, each giving a distinct sound. In fact, the shell is a key factor in a drum’s ability to ‘rumble’, or resonate. Maple is the most popular of all woods used in drumming, as it creates a nice balanced tone that’s pleasant and warm sounding. For brighter tones, birch or oak are used, which give you accentuated highs and lows. Mahogany isn’t as widely used as maple or birch, but great nonetheless for warm vintage tones. There are plenty of cheaper alternatives that budget sets use such as falkata, basswood, and Lauan. They all do an okay job, but maple, birch, oak, and mahogany are the best woods. 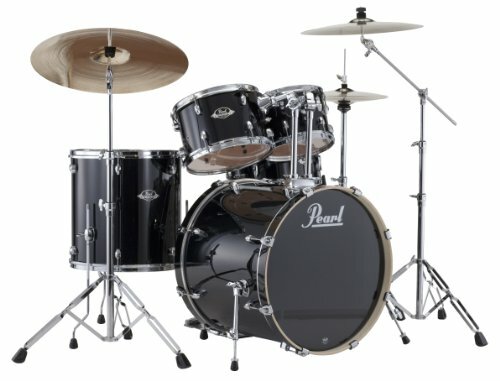 Shell Packs vs Complete Drum Sets? When you look at pictures of drum kits online, they always show you the full drum set, however, if you’re looking a what’s called a ‘shell pack’, beware! This isn’t a complete kit, it’s only drums (no cymbals or hardware). Shell packs tend to be premium, higher-end drums, and for people who are serious about upgrading their drums. Unless you already have all the other components you need for a complete set, it’s better value for money to buy a complete set. How portable do you need it to be? Consider weight, size, ease to collapse. We review four and five-piece kits below. 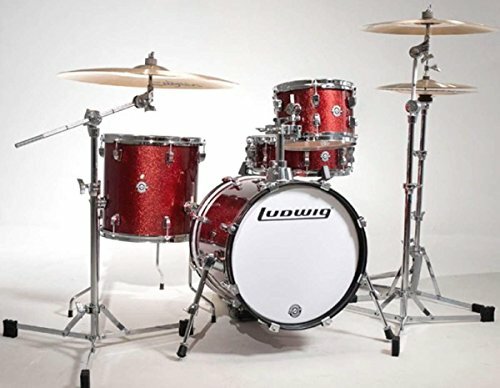 If you need something that’s going to be easy to sling in the back of a cab, then look for a four-piece with small shells, like the Ludwig Breakbeats (see below). There are some fantastic budget options, however, if you’re planning to really get into drumming, or you restarting a hobby, think how likely you’ll outgrow a budget set after a year or so. You may be better off saving up for a better set that you won’t grow tired of after a short time. It all depends how serious you are about getting into it, and what amount of disposable income you have. High-end kits aren’t always the best solution either – unless you’re not going to be on stage in front of huge audiences then it may not be worth buying a flashy set that is likely to get knocked about by the odd drunken stage invader at your local bar. Brand loyalty is kind of pointless. A drum set by one brand could be taken to the next level by adding a shell from your least favorite brand, and you’d never know unless you took the time to explore all the options. The more time you spend getting to know different drums, the better your kit will sound. Unlike the others on this list, Gammon is a small company, owned and ran by a single family. Their drums likewise have a ‘homely’ feel to them, usually encompassing a warm sound. They look good without being flashy and have a fair and affordable price that fits with the solid performance their drum sets deliver. They aren’t producing the world’s best drums, but they aren’t trying to either. What you get with Gammon is durable, reliable and sounds great – perfect for live performances with a band that’s growing a loyal fanbase. You could easily start out learning on a Gammon entry level set, upgrade the pieces as you develop and never need to go looking at other brands even as a professional. 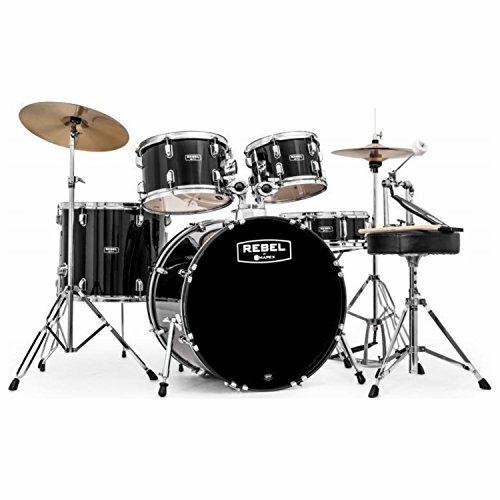 This full-size kit is intended as a total beginners’ drum set, but would suit young adults and teen novices, and includes all 5 drums (22” bass drum, 14” snare drum, 16” floor tom plus 13” and 12” mounted toms). Two cymbals are also part of the set, a 12” hi-hat and 14” crash. As well, you get stands, stool, sticks, hardware, pedals, and a drum key. As the cheapest product on the list, this is squarely targeted at the adult beginner who doesn’t want to drop a ton of money on their first kit. It’s perfect if you fancy giving drumming a try without committing too heavily financially. Capable of covering most tracks that a learner would want to copy from their favorite bands. Comes with an assembly guide and instructional learners DVD. Low cost makes it a good starting point for those who aren’t sure if they will stick with drumming for a long period of time. As a low budget product, the Gammon Percussion lacks in ‘oomph’ and can sound a little tinny. Cymbals will need to be upgraded to a better quality replacement as soon as possible for a dedicated learner. 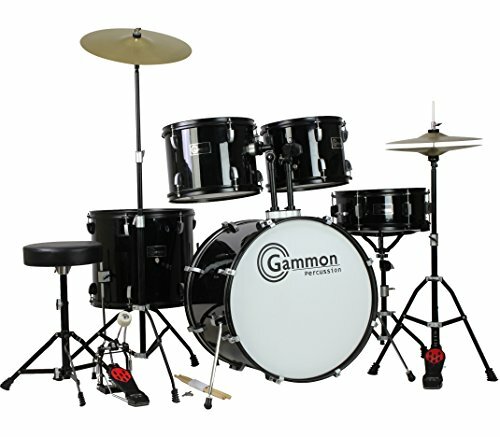 Another complete drum set, like the Gammon set, this comes with all the hardware and is an excellent choice for the novice. It includes a 22” bass, 16”, 12” and 10” toms and a 14” snare, and for cymbals you get a 14” hi-hat and 16” crash, as well as all the other bits you get with the Gammon. What sets this apart though is the choice of wood, poplar, which gives the set a warmer sound. This is reflected in the slightly higher price (compared to the Gammon). Other standout features include a Remo self-muffling bass drum head, ideal for playing lower volumes. This a complete beginner set for someone who’s willing to pay that little bit more for better quality shells. Hardware is a good standard and long-lasting. Poplar shells add to the tone of the drum shells. Everything needed to start playing is included. Like many entry-level drum sets, the included cymbals are the weakest link. Drum heads are also worth upgrading to more durable varieties. No drum mutes are included, so will need to be purchased separately if the volume level is a concern, as the low frequencies can easily penetrate walls and floors. 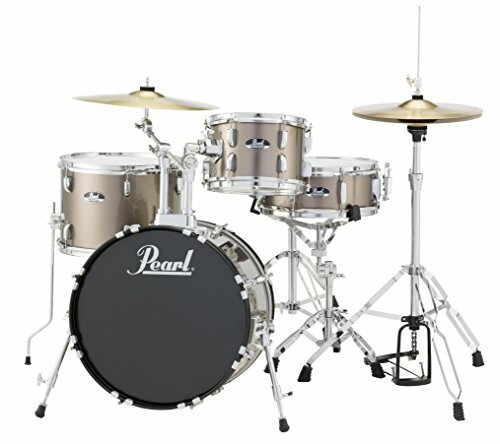 If you’re willing to spend a little more money, the Pearl Roadshow is an excellent first drum kit for beginners. The instructional videos on Pearl’s website make setting up, tuning and getting started easy for someone who has never done it before. The kit includes 22” bass, 10”, 12” and 16” toms, 14” snare and two cymbals, 14” hi-hat and a 16” crash plus all hardware. Although the cymbals stand will stick with you for a long time, the cymbals themselves need upgrading immediately. The drum throne is quite small, and a larger size will be preferable for adult learners. The drum heads should be replaced with higher quality heads, which is very inexpensive. 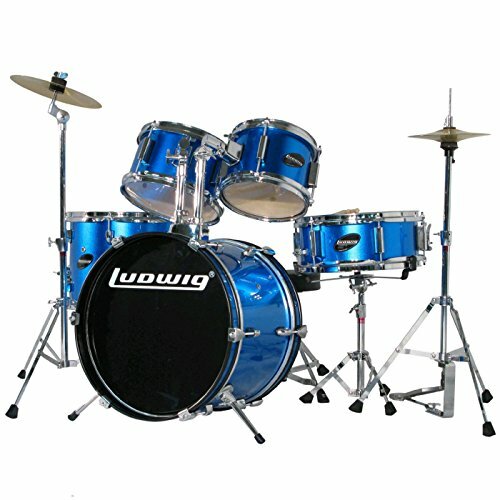 An exact replica of a full-sized adult drum set, the Ludwig Junior is one of the best drum sets for kids as it will allow them to learn the right movements, how to set up the drums and tune them right from the start. The drums are sufficiently smaller for young nippers: a 16″ x 10″ bass drum with a double tom mount, a 13″ x 10″ floor tom with legs, a pair of 8″ x 5″ and 10″ x 5″ mounted toms and a 12″ x 4″ snare. Plus you get everything else you’d expect from a complete set. As it’s a miniature version of a full-size kit it sounds pretty good for the money, it’s for kids really (or very small adults). Very sturdy hardware will keep it in playable condition for a long time. It isn’t some chintzy wannabe kit and doesn’t sound like a toy. Comes with everything needed, such as sticks and a learning DVD. Almost as expensive as full-size adult kits, there are cheaper alternatives out there if you’re less fussed about quality. Low-quality cymbals (although kids likely won’t notice or even care). Now we come to one of the best drum brands on the planet, Pearl, who are a huge brand in terms of market share and user satisfaction (there are proper raving fans out there). Pearl is best known for producing solid quality drum sets in the mid and budget range that outperform what their price tag would suggest, being on par with sets that other brands charge much higher prices for. As a brand, they offer a solid introduction for novices and are able to cater for a drummer as they grow in skill and knowledge. Their Export range is a good example of a perfect beginner to moderate set, for the individual who can already play but wants to take their playing up a level. The one we have here is the New Fusion, with 6-ply poplar/mahogany shells made up of a 22×18 bass drum, 10×7 and 12×8 rack toms, 16×16 floor tom and a 14×5.5 snare, as well as a selection of stands. Unfortunately, this set doesn’t come with cymbals, which is a shame. Standout features include their proprietary opti-loc suspension system for mounting three toms that can resonate freely while remaining wobble-free. For the money you get some decent equipment here, and they’re a superb mid-priced option, ideal for home or playing small gigs. Decent beginner to moderate set. If you check out the drums in any recording studio, you’ll probably notice the Ludwig brand somewhere. They’ve set the standard for high-end drums, although they aren’t shy about putting a price tag that matches their reputation. For the Breakbeats range, they’re really gone the extra distance and made arguably the best portable drum set at a very affordable price. Even better, it’s designed by the legendary drummer/frontman of the rap band The Roots (Questlove) who is renowned for sculpting ridiculous grooves. So what do you get? Well, it’s a 4-piece set, and positioned on a riser for optimum reach with a very compact 14×16″ bass drum, 7×10″ tom, and 13×13″ floor tom. This gives you the perfect set-up for creating beats in tight spaces. Unfortunately, this is only a shell pack, so you’ll have to buy the rest of the hardware yourself, but if you’re looking to switch out your shells, this is a great option. 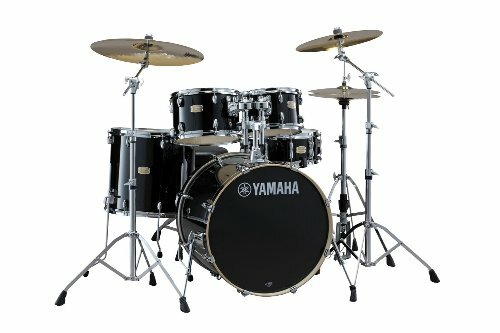 This is an urban drummers dream, as its a gritty, raw, ‘break-able’ kit for gigging in clubs fits in the back of a cab. As well as the compact, mobile design, you get quality Remo heads and a velvet storage bags. This will no doubt suit the drummer who wants travels / gigs a lot but wants to upgrade their shells. Superb for gritty, funk-laden, jazzy grooves. Riser for optimum reach, makes it ideal for small gigs. Designed by The Roots drummer. Only a shell pack, you’ll have to buy other hardware separately. Nobody can question Yamaha’s class when it comes to electronic drums, it turns out they do acoustic drums pretty well too. A case in point is this 5-piece kit made from that highly sought after and resonant wood, birch. With a gorgeous high-gloss lacquer finish and six-ply structure, this kit produces a warm and punchy tone with increased resonance and sustain. Thanks to it’s YESS mounting system (YESS stands for the Yamaha Enhanced Sustain System), you get a crisp attack which ‘opens out’ the sound of each shell. In addition, it comes with die-cast claw hooks and rubber insertion plates to reduce noise, as well as buffered resin clamps to keep rattling at a minimum. Unfortunately, it’s only a shell pack, so not ideal for the complete beginner, unless you’re willing to buy all the other hardware separately. Birch is a favorite with jazz players, and gives you a warm vintage tone. This model is one of the best jazz drum sets out there. It’s also great for transporting too, as the built-in stoppers make it easy to take apart and set back up again the exact same way. Birch wood, great for jazz. Buffered clamps to reduct rattling. Drum snobs may turn their noses up at the brand. Shell pack only – no cymbals, stands, or kick pedal, or throne included. Now we get to the premium products, the first on the list is the Paladin from ddrum (no, it’s not a typo). This is a complete set, but with only four-pieces. However, for the price you get a lot of the best material – i.e. maple – which gives you a warm, vintage sound. With maple four-ply tom shells for maximum resonance, and eight-ply maple/poplar bass and snare drum shells, it produces a classic, bright voice, you get unimpeded resonance. The deep green zombie color is knock out too. High-end choice of woods for excellent resonance. Complete set, but only four pieces. If you want to go ‘full-maple’ the Gretsch Renown is for you. These exquisitely made drums are made with seven-ply natural maple, 30-degree bearing edges, and exclusive ‘silver sealer’ interiors. 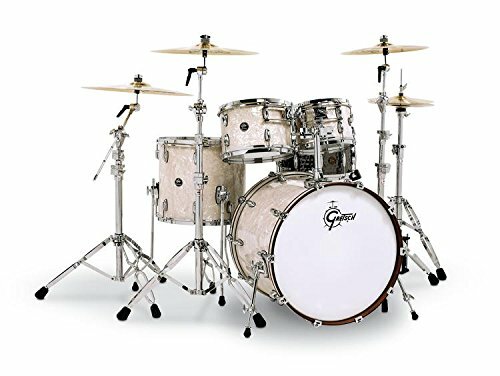 This kit delivers the traditional Gretsch sound with an exceptionally open, harmonic tone that provides the versatility needed to meet the demands of the hardest working drummers. It’s a four-piece shell pack, with 10” and 12” mounted toms and 16” floor tom. You also get Remo snare, toms and bass heads. From the budget end, the Pearl Roadshow is the best value for money. You can’t question the brands quality, and for the price, you get a lot of drum for your dollar. At mid-price, if you’re looking for something smallish and relatively cheap, the Ludwig Breakbeats is great for smaller venues, apartments, home studios and or wherever you please. Especially if you looking to produce the sort of gritty, urban beats you’d find on a hip hop track. The only downside is it’s only a shell pack, so buying the extra bits will cost you. However, it’s worth what you’ll end up with. 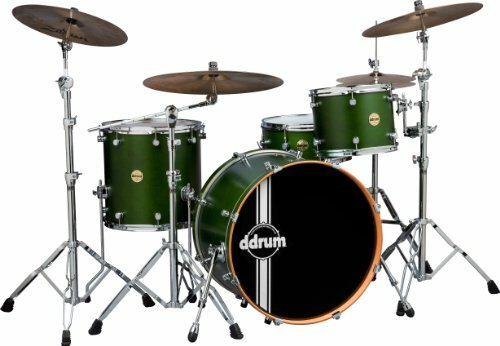 From the high end, for a complete set you can’t beat the ddrum, especially if, like me, you think the zombie green looks incredibly cool.